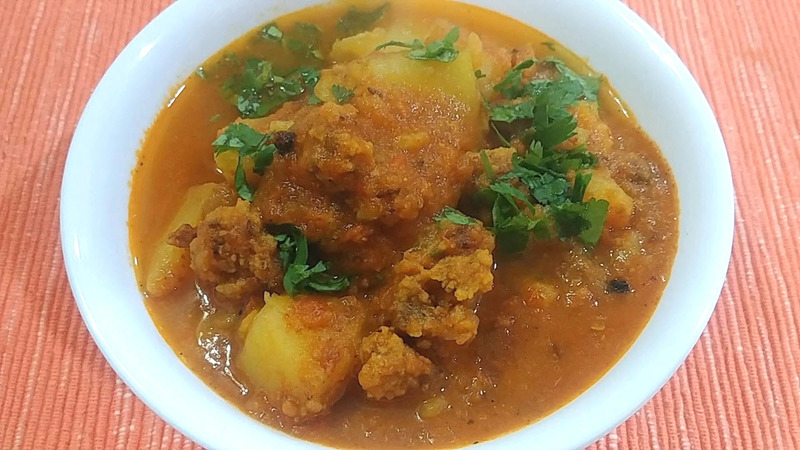 Aloo Badi Curry is a very traditional curry from the states of Uttar Pradesh and Punjab. Actually making badi curry is great way of adding protein to your food because badi is made of dal, which is rich in protein. In Punjab, curry is made of onions and tomatoes but in Uttar Pradesh, only tomatoes are used. Here I am going to make it without the onions but feel free to use onions if you like it that way. Peel potatoes and cut them in 1 cm thick pieces. Chop green chillies and keep aside. Break urad badi in big chunks. Heat 1 tbsp oil in a pressure cooker and add broken badi to it. Fry them till they brown a bit. Keep stirring constantly for even browning. Remove them from cooker and keep aside. Heat the remaining oil in the pressure cooker and add cumin seeds. Wait till they crackle. Add turmeric powder, coriander powder, red chilli powder and fry till the spices are fragrant. Quickly add freshly blended tomatoes and chopped green chillies. Cook till oil starts separating. Stir constantly. Add potatoes, fried badi, salt and add 3 cups of water. Close the lid and pressure cook. Once the cooker starts whistling, reduce the heat and cook for 7 more minutes and then turn off the heat. Open the cooker when steam dies. Add garam masala and mix well. Aloo Badi Curry is ready. Garnish with coriander leaves and serve it hot with Parantha.